Hello again! Have you missed us? We're sorry we've been a bit slack on our blogging of late - but Santa's day has finally come (only 360 days until the next one...) and we no longer need to crowd-surf to the baby room! We'll be back in full bloggy glory by 2010, with book reviews, toy recommendations, wish-lists, internet links, book-to-movie adaptation news, and your regular old monkey business. In the meantime, GUESS WHAT!! (Imagine us jumping and clapping our hands in glee, that's how awesome this news is). George plush is BACK! George in various sizes, in his yellow or red shirts, George wearing the yellow hat, George in pajamas. Ahh, the wonder of snuggly monkeys - I don't think we've ever been more happy to see our smiling Fed Ex friend, than when he's carting in Georgies! Unfortunately, we are still waiting on the 16", 26", and travel playset, but I hear that those are on their way soon as well. Don't forget our Christmas sale, either: All Christmas merchandise is 30% off - so gather up those Rudolph ornaments, Himalayan stockings, or mini tinsel trees you were eyeing last month! Tragic news! The company that supplies us our plush Curious George, Russ, had unfortunately underestimated the demand on George and has run out of fabric. Right now we have only 16" George puppets and the dress up sets, which come with 10" George and two outfits. We had hoped to receive the other varieties of George before Christmas, but alas, it will not be. The new word is that George fur, and thus cuddly Georgies, will be back on hand in January. We're extremely sorry for the monkey fans who were hoping for a plushy this holiday season, but you can always call us to reserve your favorite style for next month. Allow me to introduce or reacquaint you with the Moomins: those happy little trolls that look like Hippopotami and are the greatest Finnish export since...EVER! Author/illustrator Tove Jansson began writing fairy tales to escape from the dreariness of World War II. The books, which followed Moomintroll and his family have since taken off into a series of novels aimed for ages 7+ and a comic strip printed in London in the '50s for several years. They're as popular and ubiquitous in Scandinavia as Disney is in America, and with recent re-releases Stateside, they're destined for a North American takeover! The creation of a claymation series in Germany has also cemented their European popularity. The Moomins are also wildly popular in Japan following a popular animated cartoon there. The books and comic strips follow the creative and bohemian Moomin family and their various friends on wacky adventures. Sweet, gentle Moomintroll, the main character. His best friend Snufkin, the free-spirited, detached vagabond. His friend Sniff, the opportunist. His vain but sweet lady-love Snorkmaiden. His gentle and comforting Moominmamma. His adventurous and wander-lusting Moominpappa. And the mischievous yet insightful Little My. This was the first of the books to be translated into English, and as such I feel it's the best introduction to the books as the author includes a great preface from Moominmamma and many of the characters are introduced formally. This one is a collection of short stories whose only relation is the characters are all in Moominvalley. The comic strips have just now been released in the US from Drawn and Quarterly. Thus far there are four volumes (with the 5th and final coming June 8, 2010). The strips are grouped together into great story arcs that are some original story lines and some drawn loosely from the novels. They work great on their own, or with the novels, or as a quick introduction to the Moomins. These are great for all ages. Ms. Jansson also published a few picture books with Moomin characters that are just now being released in English. The first (and only right now) is The Book about Moomin, Mymble and Little My (hardcover, $16.95), in which Moomintroll, on his way home with milk for Moominmamma, is derailed in an effort to help Mymble find her missing sister Little My. The book is a TOTAL joy, written in verse, with wild and colorful illustrations, and die-cuts throughout the book that expose illustrations from the next pages. Moominmamma and Moominpappa & hot air balloons! Tove Jansson didn't just write for the young at heart. She has novels for adults that are just as deep and surreal as the Moomins. The New York Review of Books is re-releasing The True Deceiver, a book about an outcast young girl who inserts herself into the life of an aged and reclusive children's book author. Another of Jansson's books recently translated into English and released stateside is The Summer Book which follows Sophia and her Grandmother vacationing for the summer on a Finnish island. Stop in and meet the Moomin family: no matter what age you are you will be enchanted! Cynthia von Buhler is the cat's meow. 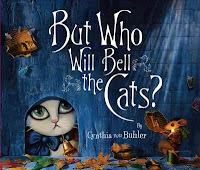 To add to all the holiday cheer/shopping happening this weekend, we're delighted to have a signing with author, illustrator, and all-around artiste extraordinaire CYNTHIA VON BUHLER! Cynthia will be at Curious George at 1 pm SUNDAY, DECEMBER 13, to sign her purrfect picture books But Who Will Bell the Cats? and The Cat Who Wouldn't Come Inside. These gorgeous books feature miniature sets meticulously sculpted, painted, collaged, and photographed by Cynthia. Her three intertwined websites are themselves works of art; besides having beautiful illustrations from the books, they're jam-packed with interactive extras. Go explore to learn how to sew a belled collar for your kitty, perform an amazing card trick, and build a Sculpey cat, watch animations or listen to music, and become hypnotized by Cynthia's huge body of multimedia art! I grew up watching Reading Rainbow, starring LeVar Burton (AKA "Lt. Commander Geordi La Forge" on Star Trek: The Next Generation, another show my geeky childhood self was addicted to). LeVar would introduce each episode with a vignette based around a topic like nutrition, genealogy, dance, or homelessness, and present a thematic picture book which was then read and shown page by page. THEN came my favorite part: kids my age got to recommend their own favorite relevant books. LeVar would segue into this segment by saying, "But you don't have to take my word for it..." -- a phrase as memorable as the catchy theme song. Reading Rainbow helped validate the importance and pleasure of reading for bookish little me by taking kids' opinions about books so seriously. So, in the spirit of LeVar Burton and the soon-to-be-defunct Reading Rainbow (RIP), here's the first batch of reviews from our new Curious Kid Picks board, located in the chapter book room on the back of the yellow bench. We hope your kiddos will be inspired to read some of these titles and/or write their own reviews! As LeVar says, see you next time -- and all you young reviewers out there, keep reading and recommending! We love to hear what you think.